Why do you want to be Mrs. America? That was a question asked on my Mrs. America paperwork. Unfortunately, my answer could only be fifteen seconds in length because it will be recorded and possibly played the night of competition - if I make the top ten. While I'm content with my answer I gave, there is so much more I wanted to say. It's not that I expect all the judges will be web-surfing the contestant's blogs before the pageant, but let's just say they are.....What would I want them to read here that would give them better insight into why I want this title so badly - into why it means so much? Edited to add: Since writing this post, Congress passed the Clinical Trials bill! It will now go before the House of Representatives. Thank you so much to those of you who helped me write letters to our members of Congress! I had so much fun last night! I was asked to emcee the Payne County's Got Talent competition at the Payne county fair. The fairgrounds are a few miles East of Stillwater. I wasn't sure what to expect but it ended up being a very special night for me. You don't go to The Country Kitchen at a county fair and NOT take the pie they offer you! That would just be wrong! I felt my Cowboy boots were appropriate for this event. I think I was correct considering there were cows and other livestock directly behind the stage! Some of the cows became very loud during the performances. Maybe they were wanting to compete?! How precious is this little violin player??? Now came the most special moment of my evening. I looked off the stage to see that our second contestant was having some stage fright. Rylee is seven years old and has downs syndrome. Her mother was trying to coax her onto the stage. I went over to her and introduced myself. I was trying to get her comfortable with me so I started asking her some questions. One was "What song are you singing?". Her mother told me Rylee had planned to sing "Mighty To Save". Out of all the country and contemporary songs being sung that night, this precious girl was going to sing one of my favorite praise and worship songs! I told Rylee that I sing that song in my church. As soon as her mother that, she asked if I would go up and sing with her. She was singing to the background vocals track. She needed someone up there to give her confidence. I asked Rylee if she would come up there with me if I sang it with her and she nodded her head. I sang, not into the microphone, but only where Rylee could hear me. She started out the song tentatively, looking over at me many times to make sure I was still there and singing. Then she became confident and starting singing full-out into her microphone. She started putting movements with the words. As a worship leader, I cannot tell you how moved I was by this special moment I was getting to share with this precious and very special little girl. It was true worship - it came from such an honest and pure place. I will never forget Rylee and that special moment I was blessed enough to share with her. I can only imagine how proud her parents must be of her. After all the performances were finished, I had to kill time while the scores were tabulated. I started talking to the crowd about my daughter, Hayden, and her disease, cystic fibrosis. A lady shouted out from the audience that, if I took off my hat, she'd pass it around and collect money for the CF Foundation. I was blown away by the gesture and could not believe it when she set the hat back up on stage. It was FULL of money! In a matter of minutes, that crowd had donated over $120 to the foundation! Before I left to head home, I had to take some pictures of the animals because I had promised Hayden I would. Her request was that I take a picture with a cow...... It was a wonderful night! One I won't soon forget! Balliets is an amazing, upscale store in Oklahoma City. They recently opened their gorgeous new store on the Classen Curve and I've been dying to check it out. So I was very excited when they asked me to come do a photo shoot to highlight some of their new fall merchandise. Here are some of the pictures from the shoot. Be sure to also look at the pictures I took of the new store toward the bottom of this post. I was IN LOVE with the Burberry rain jacket! This outfit by Etro was beautiful! So classy! Check out these AMAZING over-the-knee boots! Oh, and these boots?....don't even get me started! This David Meister gown was gorgeous in person! So sparkly! This beautiful Ralph Lauren dress was sooo comfortable! Balliets has THE most amazing shoe department in OKC and the sweetest shoe buyer ever! Go see Betsy and she can help you find the perfect shoes for Fall! Have a formal event coming up??? They have an amazing selection of gowns. Jewelry and Bags!!!! Balliets has a clothing selection to die for! My favorite area of the new store is upstairs!!! Just look at the new cosmetics area!!! It makes my heart skip a beat! If you live in OKC or are ever in town, you simply MUST come see the new Balliets. You can find it on the Classen Curve at 5801 NW Grand Blvd., Oklahoma City, OK 73118. Please check out their website as well to get more info and see even more fashions and pictures from the store. I had an amazing time at my send-off party this past Friday night! 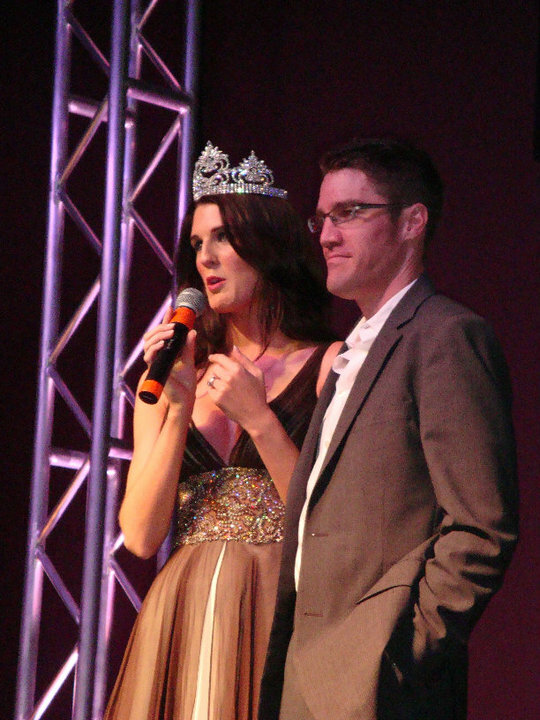 Heather Rouba, Mrs. Oklahoma 2009, along with the help of my friend Bill Crouch, completely planned and put together every aspect of the evening. As people arrived I was there taking pictures and signing autograph cards. 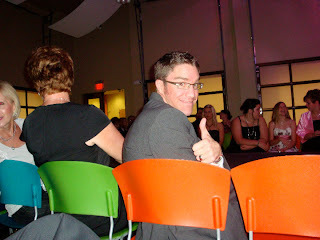 Sasha Townsend, Oklahoma's Mrs. Green Country 2011, put together a photo album for me of family pictures and pictures from my reign. She also had cards for people to write me well-wishes that fit in the back of the album. It is such a keepsake and it meant so much that she worked so hard on it. 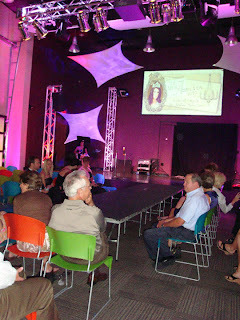 After people had time to munch on hors-d'oeuvres, a fashion show began featuring models and yours truly. 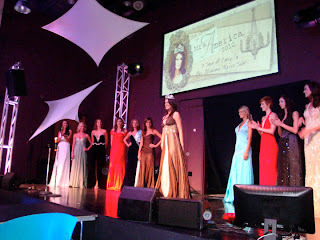 We all wore interview attire followed by beautiful pageant gowns. My beautiful Frankie Couture gown for nationals is being tailored so I wore a loaner. After the show, I performed a couple of songs and gave a speech on cystic fibrosis followed by a video I put together on the same topic. Once that was finished, everyone enjoyed some chocolate cake while looking a silent auctions items. The event was $10 at the door and all money raised that evening went to the Cystic Fibrosis Foundation. We raised over $1200!!!! It was such a wonderful evening and I felt so blessed to be surrounded by so many loving friends and family members. I hope I do them proud in Tuscon! With Teresa and Quin from Avalon Correctional Facilities. Avalon is a major sponsor for the CF Foundation each year. With friends Graham and Adrienne Turner. Graham is one of my daughter, Hayden's, favorite babysitters! With Hannah Reid. Hannah was a student at my fine-arts preschool I used to own when she was five. I can't believe she's in 5th grade now!!! With Alana Hill and Winston Banta. 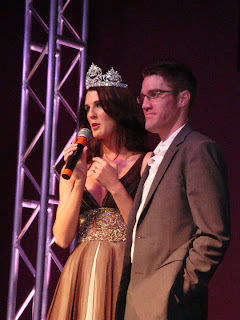 Winston was my director and Alana was on the board when I was Miss University of Central Oklahoma in 2001. With the director of the Oklahoma City chapter of the Cystic Fibrosis Foundation, Celia Palmer. My mom, Cheryl Baldwin, with her BFF's, Glee Bertram and Donna Stevens. I promise I only had three bites of this cake! It was sooo yummy! With one of the models, Stacy Saunders. She will be competing soon in Miss Oklahoma USA. With my trainer, Brian Attebery, and his wife, Jennifer. With model, Taylor Upson. Taylor is also a former Miss UCO!